Batang Ai is among one of the places where you can view wild Orang Utan (Wild Man of Borneo) in Malaysia. 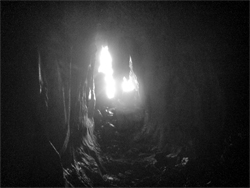 It can be reach by road and by boat into the interior area. 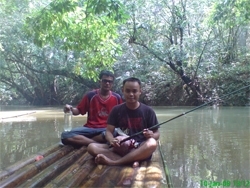 Apart from Batang Ai National Park, Orang Utan also can be seen (view) in Jingin Village which is further up-river. Pick up from your hotel in the morning driven through country road for 5 hours over 250 Km passing by pepper, rubber and cocoa plantations amidst green mountainous scenery with 3 stops along the way – first at a pepper plantation, secondly at Serian, a small town to buy some presents (Guide will advise) for the natives and lastly for lunch. Arrive at Batang Ai boat jetty in mid afternoon where a motorized longboat await to take you through the scenic Batang Ai Blue Lake and upriver for about 1¼ hours to Jingin Longhouse. This is an exceptional longhouse livelihood where the occupants depend solely on hunting and fishing and the tourist coming, they start with the Orang Utan conservation. The only crop they plant is rice, their staple food. Upon arrival, Check in to the guesthouse opposite the longhouse. In the evening, dinner and cross canopy bridge to the longhouse’s meeting the chief and longhouse family, Overnight in the guesthouse. Breakfast in the longhouse. 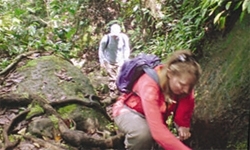 Morning, proceed with the Fullday trekking, Make a stop midway to have a pack lunch. After lunch, continue with another trekking and will be back to the lodge in the evening. Dinner and overnight in the lodge. After breakfast, start the jungle trek for about an hour to Capan. 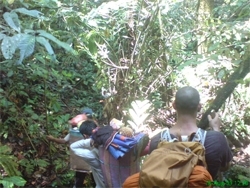 Continue for another hour trekking along Capan, a meandering narrow shallow stream and the trek will be finish at noon. You are now right in the middle of Borneo Rainforest. Cross your fingers as you hope for a glimpse of the wild Orang Utans, believed to be the largest group in one single settlement discovered so far. Rough it out and trek back for lunch. Take a boat ride via the same way to the jetty and drive back to Kuching and estimated arrive in the late evening.